A new Judy Dyble album descends, the follow-up (at last) to 2013’s Flow and Change, although a glance at her discography shows how busy she’s been in between times… in fact, last year’s Summer Dancing collaboration with Andy Lewis is still on the turntable as Earth Is Sleeping (Acid Jazz) arrives to displace it, but fair exchange is no robbery, and this one, too, is a cracker. One word of warning – the vinyl sheds two songs from its CD counterpart (“Take Me Dancing” and “Lullaby for Ellie”), and slightly revises the running order, too. But it’s a joy either way, and that despite Dyble’s liner notes suggesting that the album is less the product of a deliberate writing binge, and more the consequence of an afternoon’s spring clean. Thirteen songs are retrieved from the cobwebbed corners and cluttered cupboards in which a few had lain for up to a decade, and one’s been sitting for even longer – “Velvet To Atone” revisits a number Dyble first broached with Trader Horne, and improves upon it, too. And with everything else freshly revised and imaginatively recorded, one has no hesitation in proclaiming this an ideal, and exquisite, follow-up to whatever you want to call her “last” album. Dyble’s voice remains an instrument of crystalline purity; her writing – more poetry than pop, and as visual as it’s vocal – continues to intrigue and enthral. And her band weaves so deftly through her imagery that the album often feels more like a work of art (or, at least, a jolly good book) than anything so simple as a record. One final thought, though. Although both her writing and her delivery do incline their heads in that direction, Dyble’s much-vaunted “folk roots” have always had less to do with her than they do the eventual fate of a band she used to sing in. Throughout her solo career, after all, her tastes have been equally inclined across any number of directions (jazz, electronica and pop among them); to single out any one in particular is disingenuous at best. One does wonder, however, how we’d categorize her if her best-known ex-band had been King Crimson. Which, of course, it almost was, and idly, one speculates on what else remains in the vault. We’ve heard her version of “I Talk To The Wind.” Now where’s her “21st Century Schizoid Man”? Enchanting, distinctive, the voice of Judy Dyble is always a pleasure to listen to, she has that quintessential Englishness that sets her apart from her peers. "Earth Is Sleeping" is the latest release from the former Fairport singer who progressed to Trader Horne, a duo with Jackie McAuley (a reworking of their "Velvet To Atone" included here is stunning) before taking an extended break from recording. It's an album that gently mixes and melds acoustic styles in a wonderfully pleasing way that transcends all attempts at piegonholing. "Marianna" opens the album, it's dreamlike, a wakening song. It gives you that warm muzzley feeling you get in the morning when you know everything is fine. We can all think everything is fine in a relationship, we blindly do what we think is best, we want to bring the stars down to show our love when what's really needed is a smile and time to talk together till dawn. "Promises", a men are from Mars moment, perfectly enhanced by Jeremy Salmon's electric guitar, that you can't fail to love. Losing love through tragedy and trying to cope, heart achingly sad, "Answerphone" addresses the lengths you can go to just to hear "that" voice one more time. A dark place, that point where a part of you still believes it hasn't really happened. "Take Me Dancing" is the perfect antidote, a song which first appeared on Judy's incredible three disc anthology "Gathering The Threads", the original inspiration a memory of a young girl yearning to be grown up. Yearnings and desires. Our dreams to detract from the sometimes dreary existence of daily life. The escapism explored in "Faded Elvis", a tale told of a shelf stacker whose electricity bill is more than he spends on food. For a short while though he can be Elvis, he can dream, his hope, his life bearable, King Of The Castle for an hour or more. Caught up with dreams that don't last, "See What Your Words (did to me)" the ending of a love affair, lifted by the lilting violin of Steve Bingham leads to "Heart Of Stone" a majestic controlled response, seven minutes of melancholy steadfastness. Even a heart of stone though melts for grandchildren as "Lullaby For Ellie" shows. Can you catch a rainbow? Apparently scientists did. Between glass. And if you "Found a Rainbow" wouldn't you want to release it? "Broken Day" those moments at the end of a relationship when there is nothing more to say, the realisation that "We've wasted time, on the love that has gone", not even the words left to write a letter, Phil Toms plaintive piano adds to the resigned feeling. The beauty of a winter landscape, fresh snow, a walk with a rescue greyhound the inspiration behind the title track of the album. Brian Gulland's bassoon and Alistair Murphy's piano playfully capture the joy and pleasure of the ever changing frozen frieze being painted as we watch. Uplifting thoughts that continue into the closing track "Newborn Creatures" a song about the joy and wonder of the world in which we live. There is no mistaking the unique and hauntinly beautiful voice of Judy Dyble, who, since her days as singer and founding member of Fairport Convention, in the pre-Crimson assemblage of Giles, Giles and Fripp, and along with Jackie McAuley in Trader Horne (all pre-1970), has come back and forged a unique style of her own as a singer-songwriter, now with half a dozen solo albums to her credit since 2004’s Enchanted Garden. Here we have 13 beautifully crafted pieces, more or less in the folk-rock vein, each composed in collaboration with others in her circle, many with multi-instrumentalist and producer Alistair Murphy. The arrangements are entirely supportive of the singer’s voice, including piano, acoustic and electric guitars, bass, keyboards, drums, Uillean pipes, occasional saxes and strings, including her regular collaborator Phil Toms (keyboards and string arrangements) along with Murphy, and some names as well (drummer Pat Mastelotto plays on one cut, basoonist Brian Gulland of Gryphon on another) all making this one richly arranged collection of masterful tunes. For her part. Dyble also plays autoharp on several cuts. “Broken Day” is a classic example, with piano driving the arrangements with guitar, bass, synths, drums and a warm bed of strings supporting a beautiful lyric and unforgettable vocal delivery; on every one of the songs, the arrangements never get out in front of Dyble’s voice, though they definitely make each piece so much more powerful. On “Velvet to Atone” the arrangements are even more sparse, consisting mostly of piano, guitar, bass, synths, and low whistle, all imparting a bit of a mournful flavor. Another interesting lyric is “Faded Elvis,” a bit sad but a strong thread of stark reality woven through it. Many magical and powerful pieces are presented here, too many to single out, but all are blessed with Dyble’s uniquely gifted lyrical songwriting and vocals. Judy Dyble is like some mythical English auntie, a loner who nevertheless has a way with children. Unrecorded as the original vocalist for Fairport Convention, and barely recorded as a bandmate of pre-King Crimson Robert Fripp, Dyble’s second act almost counts as her first. She began releasing solo records in 2004, including last year’s Summer Dancing, a playful, ornate collaboration with Andy Lewis. Earth is Sleeping is a far more stripped-down and melancholy (though not mawkish) affair. Accompanied mainly by piano, Dyble connects with a disarmingly open-hearted and enchanted folk mezzo, even while relaying sad tales about Elvis impersonators and rainbows trapped in glass. Very good album from the former vocalist for Fairport Convention, Giles, Giles & Fripp, Trader Horne and JD and the MBs (Judy Dyble and the Miller Brothers [Steve & Phil])! 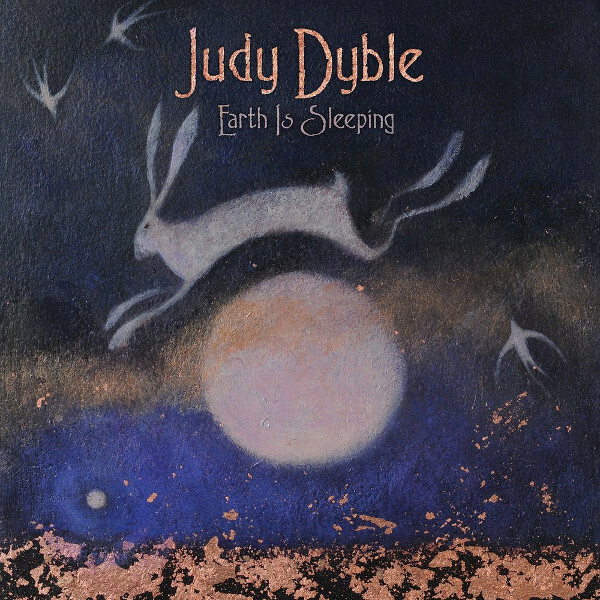 Earth Is Sleeping is the new album from Judy Dyble, formerly of Fairport Convention and Trader Horne, and this is her first album of new material in several years. Well, some are brand new compositions, some are “old scribblings” that have been revisited, reimagined and recast. There’s also a Trader Horne song from nearly 50 years ago. Yes, this album has a history to it and is a renaissance of sorts, and after many years of being lost to the public Judy is again facing the world, offering her beautiful, sweet and melodious voice to us, imparting her view of the world that she sees now. Gone is the young girl who brought Fairport Convention into our lives, this Judy Dyble is older and wiser, but still with the wonderfully pure voice and great phrasing. If I were to sum this album up in one word it would be ‘Exquisite, for that is what it is. I’ve had this album on daily repeat recently and every spin reveals new colours and depths, it’s like looking at a woven carpet and seeing the subtleties afresh every time. This music will captivate, enthral and carry you away into a gentler world, so sit back, grab a glass of something and we’ll begin. Before I start let me you comment on the CD booklet, with great artwork by Catherine Hyde, the front cover featuring her ‘Hare and Moon’, with Sarah Ewing’s ‘Snow Goose’ on the rear, and personal insights into the songs by Judy herself. The album starts with Marianna, and straight away you can hear the tenderness and clarity of Judy’s voice, strong and distinctive with a Folk edge, ably supported by Neal Hoffman’s fine guitar and subtle organ and bass parts. We then move onto Promises with its evocative opening lines: “He said he’d find her pillows filled with the sighs of doves and other promises made but not delivered.” A good and concise solo at the two minute mark lifts the song even more, past its sublime lyrics into a tremendously impressive and inspired piece of music. Sensational stuff, and with strong playing in the background, this is very fine indeed. Answerphone is very maudlin and sad, talking of how someone dials the answerphone of a deceased person just so he can hear her voice again, always hoping that she will answer even though he knows she won’t. With another fine solo by Jeremy Salmon and strings from Alistair Murphy, it’s very sad but well done and memorable. Then we are on to a far jollier song, Take Me Dancing. This a song of optimism with a touch of wistfulness and, again, sadness. The string section takes a significant part in this song with a great melody before the acoustic guitar of Jeremy Salmon is bought into play in another strong song. Next is a song from some 45 years ago, part written by the now sadly deceased Martin Quittenton and featuring a plaintive low whistle by Brendan McAuley. Judy says of this that she can’t remember why it was written but thinks that someone may have upset her. Faded Elvis is a song about a failed and not very successful Elvis impersonator who performs to escape his miserable existence. This is a masterfully written and observed piece, very melancholic in tone but with a touch of hope at the end. It’s another fine song with interesting subject matter and lovely keyboards from Phil Toms. See What Your Words is a love song, or a song about the beginning of love and how the word can carry one away to a different place. With a haunting violin line from Steve Bingham and more fine Keys from Phil Toms this is a standout track for me on an album of very strong, well written and imaginative songs. She Now Owns A Heart Of Stone is an interesting track, featuring Matt Stevens of The Fierce & The Dead on guitar and also as co-writer. The longest song on the album, it’s the one with the most prog folk leanings, and very good it is too. Tthis has an excellent saxophone segment in it to alongside the great guitar work of Stevens, Murphy and Salmon giving this a full and expansive sound Quite rightly a in not the highlight of the album, simply terrific I really like this song a lot, magical with great performances from all parties involved. Lullaby for Ellie follows, a brief and heartfelt song to Judy’s new born granddaughter, with a nice keyboard sound of tubular bells chiming and delicate lyrics this is a gentle life affirming piece. I Found A Rainbow is about a scientists who captures a rainbow, puts it between two slides of glass and wonders what would happen if it was freed. Again, short and simple but with great background strings. Broken Daydescribes the end of an affair and the sadness that brings, with another great guitar performance from Jeremy Salmon and more graceful keyboards from Phil Toms. Whilst wistful and sad it’s an openhearted song with lovely evocative lyrics. The penultimate track is the title piece, about the coldness of winter and the frost that hangs in twisted tangles, this is a winter song with strong imagery, a good double tracked vocal and haunting strings, plus a great bassoon part. The outro features fine piano from Alistair Murphy. Finally, New-born Creatures, the second longest on the CD but it does not overstay its welcome, unfolding delicately with firstly acoustic guitar and then some tasteful electric. After the opening verse there are some great Uillean pipes from Brendan McAuley and it’s a song with a fine and memorable refrain, of the glories of the world, the wonder and joyousness to be found in it. It’s a fitting close to a simply marvellous album, elegant graceful and filled with wonder it’s an album to enjoy repeatedly. It is a testament to the craft of great song writing and to subtle performances where everyone is playing for the song, to support and lift it above the mundane into the realms of something very special. I heartily recommend this to you all. Judy’s first solo album on Acid Jazz, and it’s a winner. Following last year’s album with Andy Lewis Judy has returned to her mixture / take on folk prog etc etc. I’m happy to say that if music genres are round holes, this is a square peg. It is a gentle album, full of Judy’s views of life, communicated by the wonderful way that she uses the English language. There are thirteen tracks, many co-writes by Judy and a range of others, including her daughter Stephanie Hellsten. There is also a re-take on an old Trader Horne number. Instrument wise they are mainly acoustic guitar, with some gentle electric when necessary. Keyboards, strings and gentle percussion make up most of the soundscape, though of course where a bit more power is required the drums drive the beat. Judy’s singing and writing style are precise, with every syllable carefully enunciated, every word there because it has to be. You follow the song, become part of the audience looking on as an event takes place in front of you. Songs of optimism and innocence, well maybe not all but when you have a song called “I Found A Rainbow” they have to be in there somewhere. On the dark side is “Answerphone” where the person keeps ringing only for the voice on the answerphone to cut in. The recipient is dead, but he keeps on ringing. An excellent haunting song. You know some songs are going to enthral you just from the title, “She Now Owns A Heart Of Stone” and “Broken Day” being just two. “Promises” has a guitar solo that flows beautifully, the piano and violin carry Judy’s voice onward and ever upward. I could, and maybe should go on, song by song, but I’m just going to sit back and listen to the album all over again. The cover artwork is by Catherine Hyde, with pieces on the back cover and the disc by Sarah Ewing and Rebecca Clarke. Judy’s album is magnificently illustrated once again. The booklet also includes lyrics. I first listened to this on a hot evening sitting by a lake feeding the ducks. I could have stayed there for hours with the disc on repeat. Everything was so beautiful it took me a long time to get back to earth. Alongside the CD there is also a limited edition of 500 on vinyl.